I am staying here in the apartment of my excellent friend, Jowi Schmitz. (She and her boyfriend are living on the houseboat: they got all types of housing here.) Jowi is a journalist, playwright, aikido yper-ninja, former bicycle mechanic, and novelist who will be holding a party for her new book tomorrow tonight. 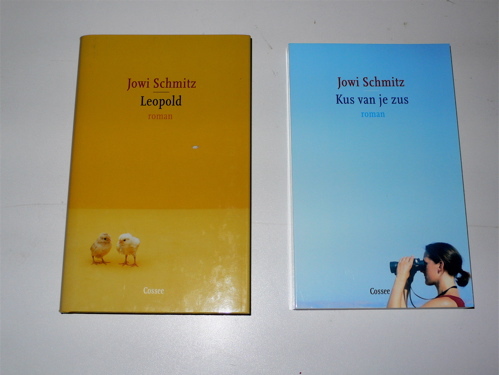 Her first novel (below, on left, with yellow jacket) is about a man named Leopold who carries eggs in his jacket. The new book (on right, in blue) is about two sisters with a very complicated relationship. I know this because Jowi told me. 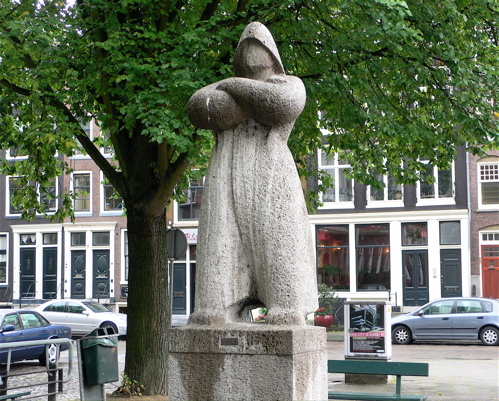 (The only Dutch I know is “coffee verkeerd,” which translates roughly as “mistaken coffee,” and will make the nice person bring you a latte if you say it out loud.) “Kus van je zus” is already in its second pressing, a fact which I found exciting. Jowi says Dutch press runs are quite small, so this is not quite as exciting as it sounds. I beg to differ.